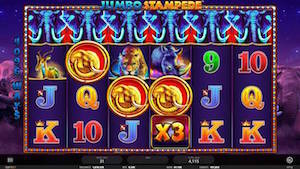 Online and mobile casino software provider iSoftBet has released Jumbo Stampede to the wider market following a successful exclusivity period with multi-brand operator GVC. Jumbo Stampede, a 4x6 slot featuring 4096 pay ways set on the African plains, is the latest addition to the iSoftBet portfolio and is certified for all regulated markets including the UK, Belgium, Portugal, Estonia, and many more. The reels feature famous occupants of the Serengeti, including tigers, gazelles, rhinos and elephants, as well as traditional slot icons and a golden scatter symbol. The scatter symbol awards between 8 and 50 free spins, depending on how many hit the reels simultaneously. Jumbo Stampede also offers a wild symbol in the form of the setting sun, which substitutes for any symbols to form spectacular winning combinations. During Free Spins Rounds, Jumbo symbols, in the form of a ferocious elephant, will pay as winning combinations even on non-adjacent reels, while Wilds will transform into x2 or x3 Wilds to create even more winning ways. Michael Probert, chief commercial officer at iSoftBet, said: “After an extremely successful exclusivity period with GVC, we are delighted to be able to offer Jumbo Stampede to the wider market.